The first step in managing scorpions around dwellings is to remove all debris, such as loose boards, rocks, stacked wood or any other materials under which they can hide. This will greatly reduce the numbers of scorpions in the area. Most scorpions are active at night. Outdoor areas then can be sprayed with a residual insecticide. 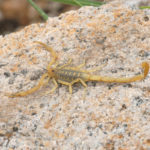 Indoor areas, such as crevices in woodwork and closets, spaces around plumbing, doorways, windows and any other areas where scorpions might hide, should also carefully be treated with an appropriate spray or dust.